Sit out on our deck. 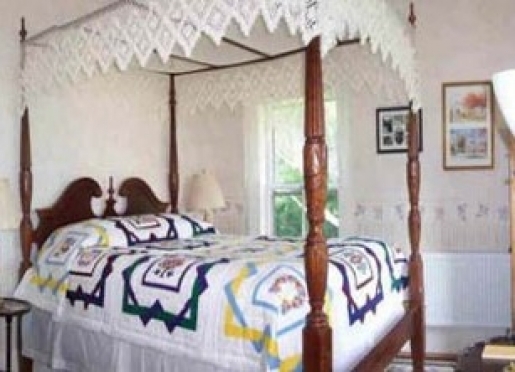 If waking up to the sound of birds instead of highway traffic is what you are looking for, then the Fitch Hill Inn is the bed and breakfast for you. 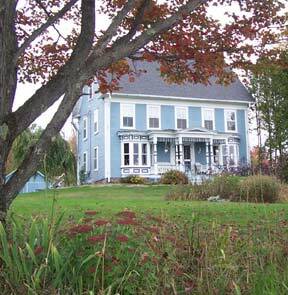 Our circa 1797 Vermont Federal farmhouse sits on a three-and-a-half acre hilltop over a quarter-mile from Highways 15 and 100, so peace and quiet prevail. Enjoy the views of the Green Mountains from the wicker chairs on the front porch. 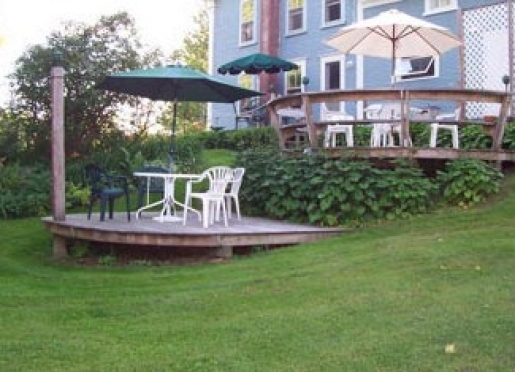 Relax on one of the decks or on the adirondack chairs with views of the beautiful gardens and woods or wander the yard. Mountain and Smuggler's Notch. It also has some of the best fishing, canoeing and kayaking on the Lamoille River, Lake Elmore and the Green River Reservoir. Hiking and snowshoeing opportunities abound and there are 3 golf courses within 20 miles for the golf enthusiast. If you're a fan of covered bridges, Lamoille County has the largest collection still standing in Vermont. If food or drink is your passion, Cabot Creamery, Ben & Jerry's Ice Cream, Cold Hollow Cider Mill and Boyden Valley Winery all offer tours and/or tastings. Like antiques? There are a number of shops and malls in the area with a wide selection of merchandise and prices (ask us for a map!). For those of you whose interests lean toward the arts, both Hyde Park and Stowe (which is only a 15-minute drive away) have summer theater productions. Music productions, from intimate settings to larger concerts, are available in Morrisville, Stowe, and Hardwick. There are a number of art galleries in Stowe and in Jeffersonville that are open year-round. 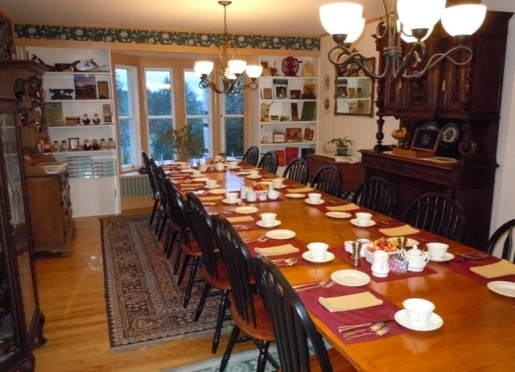 When you are done exploring the area for the day, return to the Fitch Hill Inn for cookies and tea while you plan where to dine that evening. Use the menus collected from many local restaurants to help you make this decision, made difficult by the numerous outstanding choices in and around Stowe! If the sound of the birds doesn't waken you, perhaps the smell of Green Mountain Coffee brewing or homemade muffins baking will! 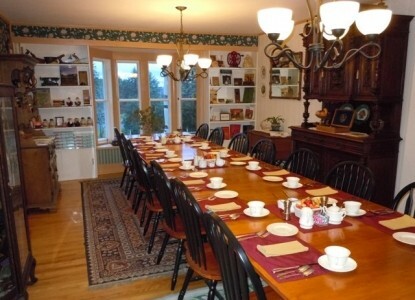 A full hot breakfast consisting of fresh fruit, homemade muffins, a main course such Stuffed French Toast or John's Savory Egg Casserole, fruit juice and coffee, tea, or hot cocoa is served at the large table in our dining room. Let us know if you have any special breakfast requests or dietary needs. We will be happy to accommodate them. Our goal is for no guest to leave the breakfast table hungry! 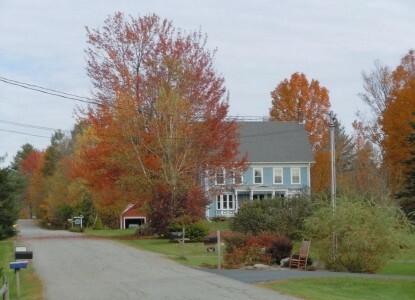 No matter what time of year or what your interests, Lamoille County, Vermont, offers a great getaway. 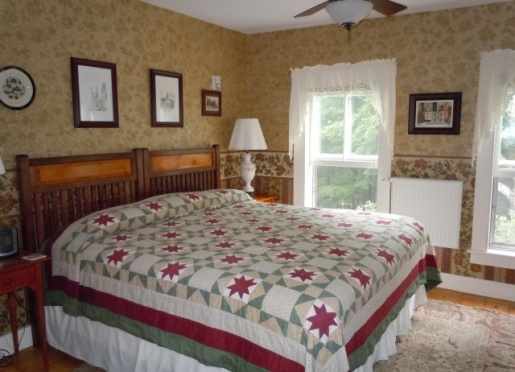 And hosts Julie and John Rohleder will make your stay at the Fitch Hill Inn one of the highlights of your trip to this beautiful corner of the world. Travelers are always looking for memorable and relaxing experiences. Let’s discover more through the words of our innkeepers. Many thanks to Julie and John for sharing their secrets with BBOnline.com! It's a mix of people coming to Johnson State College, either for the college itself or for one of the summer programs there (Burklyn Ballet, soccer camps) and people touring the area. We have a quiet location, off the main road, and people love our breakfasts. We aren't in a city, and only people coming to visit family come specifically to Hyde Park. People come to this area for the outdoor activities and to enjoy the rural countryside. We are about 15-20 minutes north of Stowe, VT, a tourist destination town. How much they like the welcoming feel of our inn. 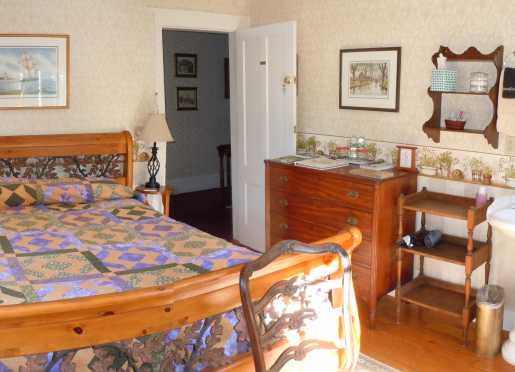 Also, the peaceful environment, the delicious breakfast, and how well we have taken care of our historic home all contribute to the compliments we have received about out inn. How many different things there are to do. A whole week's worth of ideas is on the Activities page on our website. Our village has a pretty Main Street with a bakery and some interesting architecture. The Lamoille Valley Players put on 4 shows each year at the Opera House and Hyde Park Home Days takes over Main Street one Saturday in September. We are about 1/2 mile from Main Street. The Lamoille Valley Rail Trail is now open from Rte 15A in Morrisville through Hyde Park to Cambridge for walking, bicycles, and horses (no ATVs) and snowmobiles, skiing & snowshoeing in winter. When complete the trail will run from St. Johnsbury to Swanton on Lake Champlain (93 miles). We have several nice restaurants nearby in Morrisville. 10 Railroad Street is nicer casual dining. Lost Nation Brewery has very good pub food and a large selection of local beers. Our website has an extensive activities listing, with links to all the things to do (see link above) http://www.vermontvacation.com is the state tourism site. VisitVT.com is the Vermont Chamber website. No pets. Nye's Green Valley Farm in Jeffersonville has a cottage where they accept pets. 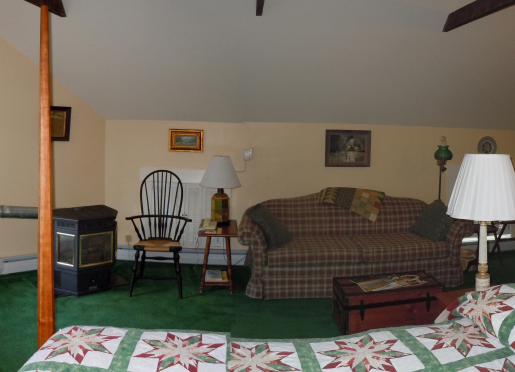 The Sunset Motor Inn in Morrisville has pet rooms, too. Breakfast is part of our name, so we want it to be as memorable as the rest of your stay, and since breakfasts are as different from B&B to B&B as the decor, we thought we would tell you about ours. First, we serve at a time convenient to you, the guest, at any time between 7 AM & 10 AM. That way you can get up and start your day or sleep in and relax. Need to be up early to travel? We can set you up with coffee or tea and some muffins to get you started. Just let us know the morning before! We want you to enjoy your breakfast, so we'll ask you about what you like and if there is anything you can't eat. Whether it is an allergy, diabetes, or gluten-intolerance, we have options available. We are also happy to do vegetarian or vegan breakfasts, and we can accommodate our kosher guests, too. Breakfast starts off with fresh from scratch muffins, coffee, tea, and juice. Next, a fruit course such as Cinnamon Cooked Apples or Baked Pears with Raspberry Sauce and Vanilla Yogurt gives you a healthy start. Then a main course such as Stuffed French Toast with Blueberry Sauce or John's Savory Egg Casserole. 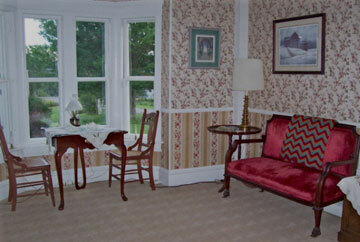 Travelling to Lamoille County on business? Hyde Park is the county seat of Lamoille County, with easy access on VT Rtes 15 & 100 to Belvidere, Cambridge, Eden, Elmore, Jeffersonville, Johnson, Morrisville, Stowe, Waterville, and Wolcott. Harwick and Craftsbury in Orleans County are also within easy reach. A hot breakfast is served on the premises, so there's no need to go out to a restaurant or make do with just coffee and pastries. We will serve your breakfast at a time convenient to you, so you can make an early meeting if you need to. We have Wi-Fi, cell phone reception (Verizon and AT&T), and a guest computer if you don't carry your own. Our check-in time is from 3 -9 PM, allowing for late arrivals. Our Dining Room is available for business meetings. A full lunch (soup, sandwiches, drinks, dessert) or just coffee, soda, and muffins or other snacks can be provided. The meeting room is free to overnight guests, but must be reserved in advance. Meals are plus 9% tax.